Italian Studies at Notre Dame and the Rome Global Gateway invite you to participate in a conversation that will bring together the Notre Dame community in Rome and on the main campus, through reflection on our connections with historical events and works of literature that significantly shaped Italian culture in the 20th Century. Readings from Rome will feature passages from Giacoma Limentani’s Trilogy and Giacomo Debenedetti’s October 16, 1943. Refreshments served. Click here to RVSP.Texts from the main campus will feature works of Primo Levi. On April 11th, at 11.30am South Bend time and 5.30pm Rome time, students and faculty will meet in teleconference across the two locations to explore together questions of profound human significance. The event will centre around the reading of selected texts that, in different ways, highlight living points of intersection between such questions and our work at Notre Dame. One group of readings, presented in Rome, will concern the history of the Jewish community of Rome, and in particular the events around 16th October 1943, when more than a thousand members of the community, including elderly persons and children, were deported to Nazi concentration camps. The readings will also reflect the concrete connection between the Rome Global Gateway and the history of the Jewish community of Rome, represented by the Villa in which students studying at the Gateway live. 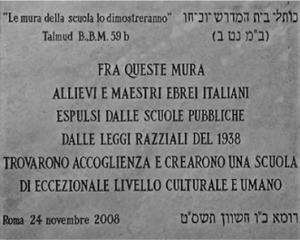 In 1938-39, the same building housed a school for Jewish students after the racial laws of the Italian Fascist government had banned Jews from access to education. It thus stands as a reminder of the vital role education can play against violence and oppression. Another group of readings, presented on the main campus, will be from works by Turinese Jewish chemist and writer Primo Levi, one of the most important authors of the 20th Century and best known for his book, If This Is A Man, an account of his time in Auschwitz. The readings will also reflect the importance of Notre Dame as a centre for the study of Primo Levi’s life and work. The Primo Levi Collection in the Department of Rare Books and Special Collections of the Hesburgh Libraries is one of the most important collections of Primo Levi’s writings outside of Italy. As pointed out by Father Hesburgh at its inauguration, the Primo Levi Collection is a significant contribution to Notre Dame’s continued commitment to education as vital force for civil rights, human rights, and social justice. In this same spirit, and in commemoration of the anniversary of Levi’s death, Notre Dame students and faculty will gather on April 11th to reflect together on how significant voices from the past can help us affirm humanity and work responsibly towards the future. Please join us in this important conversation – the first in a yearly series of events bringing together communities in Rome and South Bend in vital inter-religious and inter-cultural exploration. 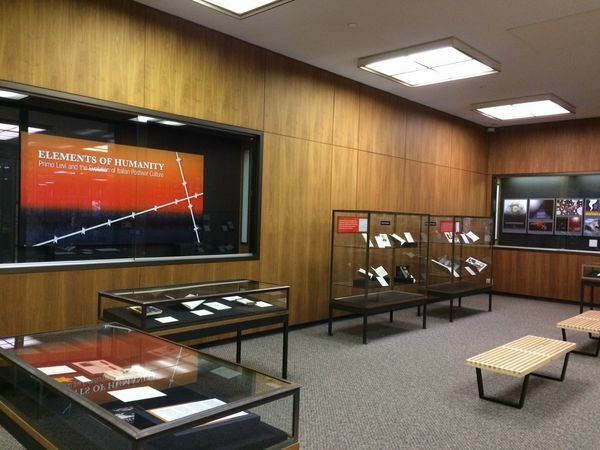 Image of Elements of Humanity: Primo Levi and the Evolution of Italian Postwar Culture – an exhibition held in Fall 2017 in the Department of Rare Books and Special Collections of the Hesburgh Libraries at Notre Dame. The exhibition was centered around the holding of the Primo Levi Collection.